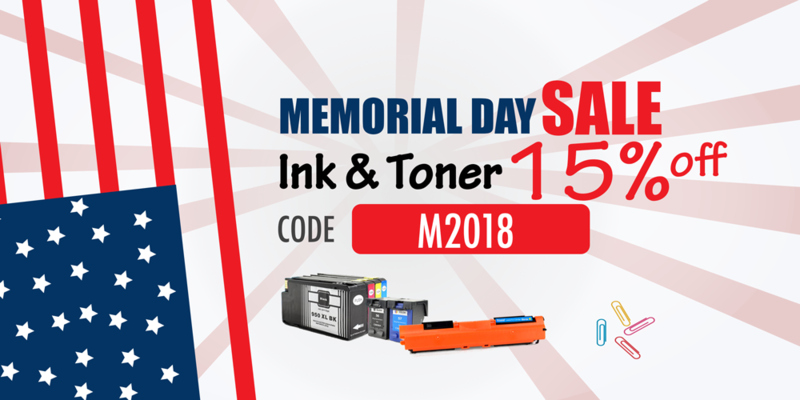 All Printer Cartridges and Ink Cartridges on Sale during the Memorial Holiday week. Everything 15% Off! When you are at check out, enter code M2018 to get 15% off. It is that easy! We carry printer ink cartridges and toner cartridges for HP, Brother, Canon, Samsung, Lexmark and Xerox. Remember these products are top quality with extremely competitive price. Plus all Printel ink and toner cartridges come with 1 full year warranty. For toner cartridges produced by us, we used the highest quality parts available and the RoHs compatible toner. Our manufacturing process has been perfected over the past 20 years, which enable us to manufacture replacement printer toner cartridges that meets and exceeds the print quality and page yield compared to the original brand. And our price is extremely good. Take the example of Brother TN660 replacement toner cartridge, our price for single pack is $13.99 when the price of the original Brother is $53.99. And our two-pack Brother TN660 replacement toner cartridge only costs $27.14. It is no brainer which product you shoudl buy. Why we can offer such competitive price? Because we are the manufacturer and we reduce the middle man to bring you the best quality with best price. You probably already know that the benefits of using remanufactured ink cartridges. First, remanufactured ink cartridges delivers equal print quality as the original. Secondly, remanufactured ink catridges are usually only one third of the original brand catridge. Third, using remanufactured ink cartridges recycles the material and reduce land fill, and benefits mother earth. With these said, why pay big bucks to brands like HP, Brother or Canon. They simply want to over charge you. Buy remanufactured ink cartridges and save some money and help the earth. When you buy over $89, you can get free shipping. Even if you don't get products up to $89, don't worry! We offer flat rate shipping of $6.95 for any order with a inkjet cartridge or toner cartridge in there. Don't worry about product return! If you find the product damaged or defective, simply give us a call, we will send you a return label so you can return the product without any charge on you. Once we receive the returned product, we will process the refund accordingly. View our Return and Refund policy. Finally happy Memorial Holiday! Stay tuned for other sales and promotions.